Price: Click below for pricing and options! What would bladesmiths want in their perfect heat treating ovens? What would they change, and why? 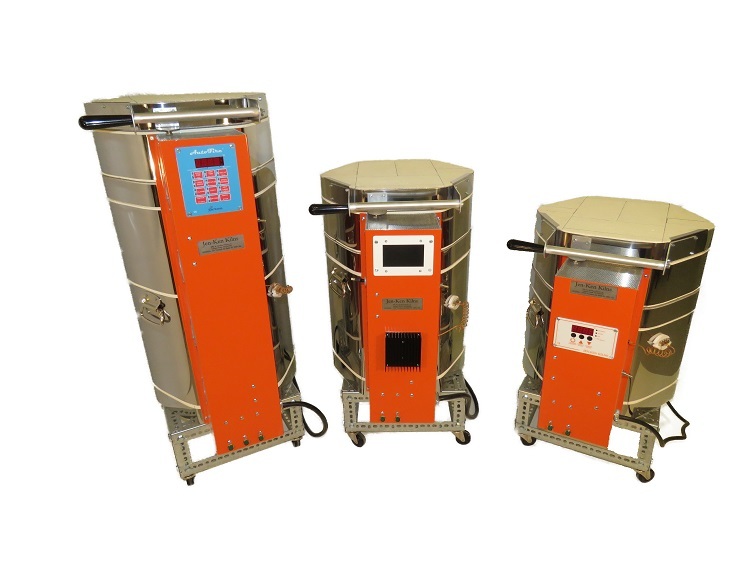 So, we asked and took all, of that insight and created a revolutionary line of heat treat ovens and furnaces that throws out the old thinking, and improves your entire heat treat experience! 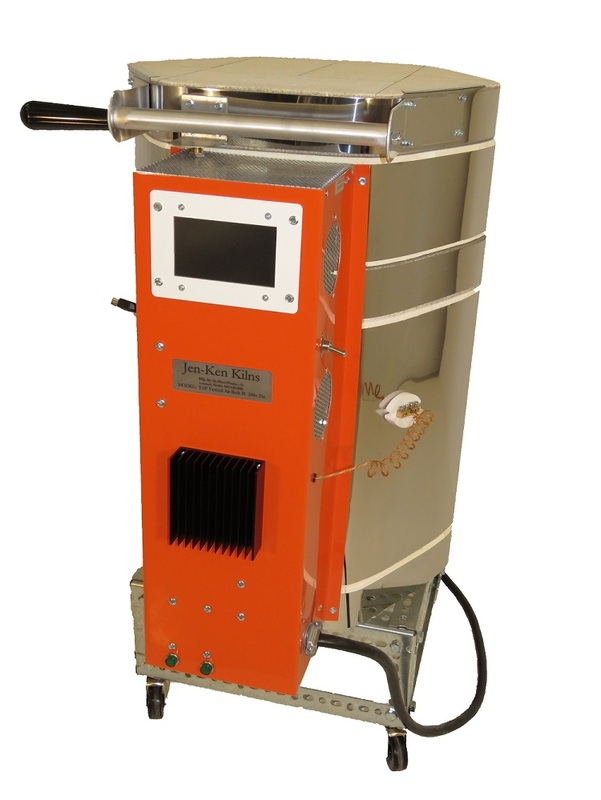 Introducing The Revolutionary Vertical Air Bath Furnace! Vertical Blade Suspension - Prevents Warps! Unparalleled Stress-Free Heat Distribution! Top Loading - The Best Heat Recovery on Full Loads! Power Interrupt Lid Switch - Assures Workshop Safety! Blades Can't Touch Live Elements! Rolling Stand with Casters - Space Flexibility and Portability! Keeps Your Workshop Safe! Large Capacity - Holds a Dozen Blades or More in a Single Load! Configurable Baffle Design - Allows Blades of All Shapes to Process Together! Here's how other kilns work... Blades are inserted into a standard front-loading horizontal knife oven for normalization, hardening, or tempering. As oven temperatures increase, blades can bend and warp as a result of the stress of leaning on their sides. Another cause of blade warping in traditional front-loading kilns is uneven heat distribution. A standard front-loader heats from the sides and the back, creating more heat at the back of the kiln. This causes the front door area to get cooler and cooler. The uneven heating causes the tip and body of the blade to be much hotter than the tang, resulting in more internal stress and warp potential, not to mention that the blades in the middle of kiln get the least heat from the coils. When the front door is opened, and the red-hot blade is removed from its horizontal position, it is carefully transferred to the vertical position on the way to be quenched. During this transition further bending can occur, causing the bladesmith to spend valuable time reversing the warp and straightening blade after blade. The traditional long kiln design requires for deep tables or stands, taking up a ton of room in your workshop. With limited bench space, you may be forced to reach around a screaming hot kiln to reach tools, creating a potentially dangerous workspace. Here's why ours works so well... We've addressed the issue of uneven heating by designing the exciting new Vertical Air Bath furnace series. Our Vertical Air Bath furnaces deliver the best heat-treat possible because your blades are suspended vertically inside the chamber, allowing the blade to heat from all sides (360° heat), delivering completely uniform heat soaking at the desired temperature. The Vertical Air Bath is a refractory brick furnace with a specially designed baffle inside. Heat is absorbed into the brick of the kiln/furnace and is contained below the baffle when the lid opens. A unique cool touch handle extends out from the side and is reversable to either side of the kiln. When standing to the side of the kiln, the lid can be lifted without a blast of heat hitting the user. The blade can then be removed with tongs, and the lid is lowered. This quick motion allows for minimal heat loss and ease of use. The Vertical Air Bath chamber is heated from below the baffle and has another set of coils in the top section for quicker recovery as each piece is removed. The included power-interrupt lid switch de-energizes the oven, as you reach in to remove a blade. The Vertical Air Bath then begins heating again when the lid is closed. The kiln is designed to regain the full holding temperature, upon the users return from the quench. Blades never touch the kiln or each other, reducing the chance of heat sinks, cold spots, and warping. Spines remain straight because your knives are removed vertically, and then lowered vertically into the oil quench. This vertical suspension from the beginning of the process to the end allows for uniform absorption of heat and unimpeded movement while releasing internal stress. Large capacity... The Vertical Air Bath chamber holds up to 12 blades of varying shapes comfortably. Blades can be suspended several ways. We recommend a pin through the tang, a spring clasped to the tang, or you can simply turn the tang sideways between the movable ceramic rods, if the tang shape permits. Foil wrapped blades can be suspended by passing the support pin through the foil sheet or via the spring clasp method. This allows the vertical suspension format to be used with every technique. The process has zero interference, leaving your blades stress free and straight. Here's why you'll love it... The Vertical Air Bath is a smarter, safer, and more portable design, made to optimize your efforts, and make your workshop safer. The furnace comes with a rolling stand which allows you to move the Air Bath out of the way when it's not in use. Think of the bench space you'll save! You'll save time and effort due to the reduction of warps and waves in your knives. The power-interrupt lid switch prevents your blades from touching live elements, keeping you safer in the workshop. The Vertical Air Bath comes equipped with a standard 3-button controller that can loaded with the most popular normalizing, tempering, and heat treatment schedules. You can choose to upgrade to a 12-button controller for ease of programming, or choose the popular TAP smart touch screen controller. All of our kilns, ovens, and furnaces come equipped with standard mechanical relays, which you can choose to upgraded to solid state technology. Dimensions Inside: The lower chamber is 9" deep and the upper is 7" to the bottom of the divider. The overall inside is 11" x 21". The outside of the kiln chamber is 16" x 25". We have great shipping rates.